Since 1 September 2017, Dr. Hilligje van’t Land assumes the position of Secretary General of the International Association of Universities and Executive Director of the International Universities Bureau. For the past two decades, she has worked at IAU committing to make higher education a key driver of societal change. 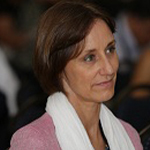 Over the past years, initially as Director and later as Deputy Secretary General, she co-supervised the overall programmatic activities of the IAU and the everyday work of the secretariat, she engaged in developing the IAU Membership base and strengthening the IAU membership development strategy. She positioned the IAU as lead partner network in the UNESCO Global Action Program on ESD by promoting the role of higher education and research in addressing the goals set in the context of Agenda 2030 (HESD). She engaged the Association in strategic partnerships to advance HESD and represented IAU at external events to foster leadership engagement and advance action at all institutional levels. She strongly believes in the importance of intercultural understanding and developed projects and other initiatives to promote higher education’s actions in this field. Convinced that societies can foster research and innovation through innovative approaches to doctoral education, she developed a six-year project on this topic for Africa and internationally. She represents IAU in various working groups and expert Committees including at the Council of Europe where she contributed to intercultural understanding initiatives and related publications, and more recently the development of a European Framework for Competences for Democratic Citizenship. Prior to joining the IAU, Dr van’t Land taught comparative francophone literature at the Universities of Groningen, Laval (Québec) and Avignon et les Pays du Vaucluse. For five years she also headed the Institute for American Universities in Avignon. She has been very active in the field of Canadian Studies globally, since 1987. She holds a PhD in comparative contemporary francophone literatures from Groningen University, in the Netherlands and completed a post doc research period at Laval University (Québec) before moving back to France. She speaks six languages and produced a number of publications related to higher education.